Macular degeneration is the main cause of blindness and severe vision loss in New Zealand. One in seven New Zealanders over the age of 50 show some signs of it. Around 17% of these people have some vision loss. 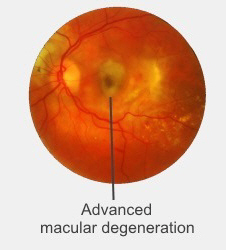 Macular degeneration affects the retina in your eye. It causes a painless, progressive loss of central vision (what you see looking straight ahead), but your peripheral or side vision (what you see around the edges) isn't affected. It usually affects people aged over 50. It is often called age-related macular degeneration (AMD or ARMD). But there are also inherited forms that affect young people. It can lead to legal blindness, but it doesn't result in total blindness. Light goes in through the front of our eyes and on to the retina at the back. The retina contains light-sensitive cells and acts like a camera film, capturing the images we see. 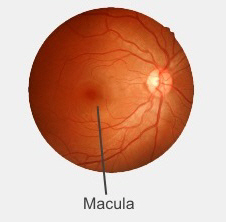 The macula is the central part of the retina. It's the most sensitive part and allows us to see the fine detail that we need to read, recognise faces and drive. It's also responsible for most colour vision. The picture shows what eye specialists see when they look through your pupil to the retina at the back. The rest of the retina lets us see less defined images and gives us our peripheral or side vision, helps us sense movement and helps us see at night. Macular degeneration is a disease that affects the cells that feed the retina. Because of the disease, waste products build up and form yellow deposits in the macula part of your retina. These are called drusen. This can start happening without you knowing, since early macular degeneration doesn't always affect your vision. That's why it's a good idea to have regular eye tests by an optometrist or eye specialist, as they can tell if this is happening. The image on the right shows what eye specialists see when they look into the eye of someone with advanced macular degeneration. Drusen doesn't always go on to cause vision loss through macular degeneration, but macular degeneration always starts with a build-up of drusen. There are two types of macular degeneration, dry macular degeneration and wet macular degeneration. This is when cells die leaving patches of missing retina. It progresses slowly and causes a gradual loss of central vision over several years. It accounts for 33% of all cases of advanced macular degeneration. Five to 10% of people who have dry macular degeneration will develop the more aggressive wet form. This occurs when blood vessels grow under the retina. These blood vessels are fragile and leak blood, which causes scarring and loss of vision. The loss of vision can be sudden and needs immediate medical treatment. We think it is caused by genetic and environmental factors working together. People older than 50 are at risk, and the risk increases with age. People with a family history of macular degeneration have a 50% chance of getting it, so it's important to get your eyes tested if your relatives have it. Smokers have three times the risk of getting it, and they tend to get it 10 years earlier than non-smokers. It's good for everyone to stop smoking, but if you have a family history of macular degeneration and you smoke, you have a high risk of getting it. Less common types of inherited macular degeneration can affect children and young adults. Information, personal stories and resources about macular degeneration. Information and resources about macular degeneration.